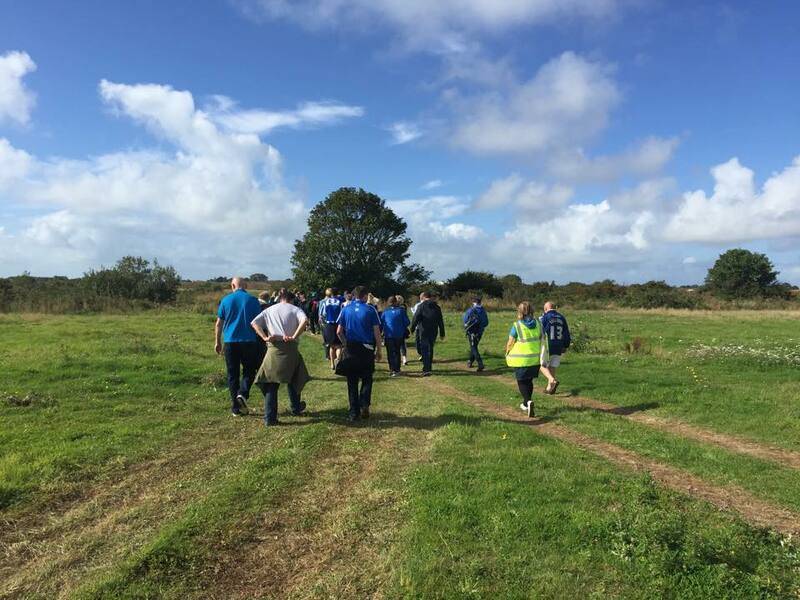 That’s what Brett Mendoza, Vice Chair of the REMF told me half way round the Jacob Shilt Memorial Walk. Try a few groups of mates Brett. Try a few thousand quid. But let’s start at the beginning. The real beginning was perhaps the awful events of August 22nd. Those are talked about in previous posts but, in summary, eleven people lost their lives on the A27 at Shoreham as a Hawker Hunter jet flying as part of the airshow crashed on to the carriage way. Each life lost is a tragedy and my heart and the heart of all Sussex residents goes out to the victims’ friends and family. As we now know, however, two were closer to home than many. Matt Grimstone was a club employee and long term fan. Jacob Shilt was an REMF team player and Brighton fan, and, by all accounts, an excellent footballer. Through the REMF Jacob knew Brett who I have known for many years. Never have I been more proud to call Brett my friend though. It is such connections that make this such a Sussex wide tragedy and I’m sure many, many local people know people affected or who had a very near miss. So we walked. I nearly walked further than most. For the second time this season I have fallen in to conversation with an Albion Roar presenter on the way to an Albion event. Firstly Ady on the way to Fulham. Now Al on the way to the Toll Bridge. Only it turned out we’d both done the bloke thing of tentatively consulting a map for the route before being a hundred percent certain that the street we were heading down was correct. Until we saw a no through road sign anyway. Then it turned out that the other Albion fans on the same route were only on it because they had been confidently following us. One of those conflabs where everyone stares at their phone and then looks for a road sign ensued before we struck out more in hope than certainty to find the very bend we were after and then the bridge. It was before nine thirty in the morning and a large gathering of Albion fans, Worthing United and Mile Oak players and friends and relatives were already at the Toll Bridge. A few of my mates were there. I would need them. A dignified minutes silence was held and I don’t mind admitting I nearly lost it. After that walking and talking became easier. I settled in with a friend towards the front of the group and we discussed our prospects for the game to come, our signings and the way the club had handled itself so well recently, Sussex cricket, the weather and beer. Like Al had said it was almost like being on the way to an away game rather than a home one. The walk felt easy but then I am currently running thirty kilometres a week to get ready for a series of races including next year’s Brighton Marathon. Others walked with young children or buggies, with a stick or with a group of older friends. But easy or hard, sunshine (which there was mostly) or rain (which there was very briefly) we were all determined. None of us would have been anywhere else. We reached Worthing United to refreshments, more emotional tributes (the first time I had seen the shirts on display there though I had been to the Toll Bridge before) and buses to the Amex. This was a fantastic touch by REMF, the club and Seagull Travel. A group of us gathered at the back of the bus just as I would have at school but I wasn’t in the mood for high jinks right then. The short journey and the very small time it took to go back along the route just served to bring home to me how unfortunate the victims were. It makes you consider your own mortality does that. The net result of being towards the front of the group and on one of the first buses out however was to be at the pub earlier than I would ever normally have been. Three pints of Palmers and some cheesy chips and a back-to-normal pre-match chat were very well earned indeed. As summer fades to autumn a last beer out in the open was also more than welcome. Then I went to the ground to meet The Boy who had been taken and looked after by my friend and to ensure we were in our seats for 2.30 for more tributes. I met them on the concourse. The Boy is a religious programme collector and already places them in a drawer in match order. I knew my friend would have got one for him and indeed he had. I pinched a quick look, a dignified tribute to all eleven victims on the back page, listed with their ages as if a team. My eyes filled again. The tributes were pitched perfectly. Giant shirts had been created and signed and were walked out. Abide With Me was sung by our regular opera singer. I think we were supposed to join in. I couldn’t and neither could anyone else. Flowers were laid by representatives of each club. A minutes applause was held at the request of the families, something I found easier to get through than the silence at the bridge. 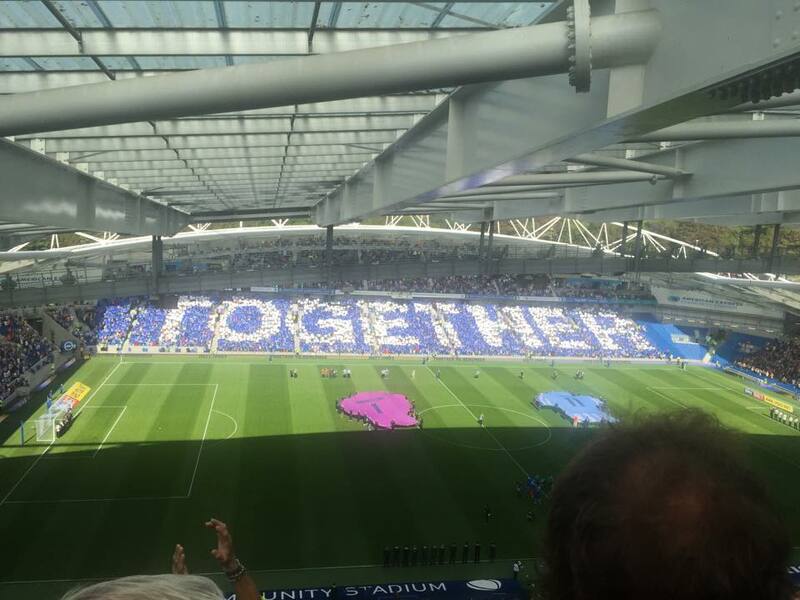 I have never, ever been more proud to be a Brighton fan. Not when we were chasing out Archer and Bellotti or on the pitch versus York. Not when I saw us running out (on telly) at Wembley in 1983 to play Manchester United, nor when we ran back out at Withdean, survived Hereford or finally moved in to The Amex. All of those moments are iconic but none have displayed the dignity and togetherness of yesterday. Paul Barber, Tom Gorringe, Brett Mendoza, Mike Langridge, Tony Bloom, Chris Hughton, Richard Reynolds and everyone else involved in making it happen, take a bow. The game? Oh yeah, there was that. After everything else it went by in a blur. I can’t adequately describe it which is why I have focussed on the other stuff. We started like an express train and were up after four minutes, Tomer Hemed putting in from close range after a quick move (though the goal was initially credited to Baldock over the tannoy). We should have been ahead by even more just a few minutes later, an absolute sitter missed after good work on our right. For twenty odd minutes we looked unstoppable. Then Hull came back in to it and dominated the ball, ensuring that, for a change this season, it would be our defensive organisation that saved us. Hull had lots of possession but no real chances. At the end we were still 1-0 up and four points clear at the top. We celebrated like we’d won the league itself. Special mentions? The Hull fans. Thank you. What an excellent set you were yesterday. Rosenior was outstanding in a right midfield role. Bong and Bruno were tested but stood firm and Greer and BFG were imperious in centre defence. Kaz got himself booked as I predicted in the pub and is now suspended. Baldock was a menace, Hemed scored and HE returned for a cameo at the end. A bigger Bobby but still one who doesn’t give the ball away. A club icon on the day the club made itself iconic in Sussex again. 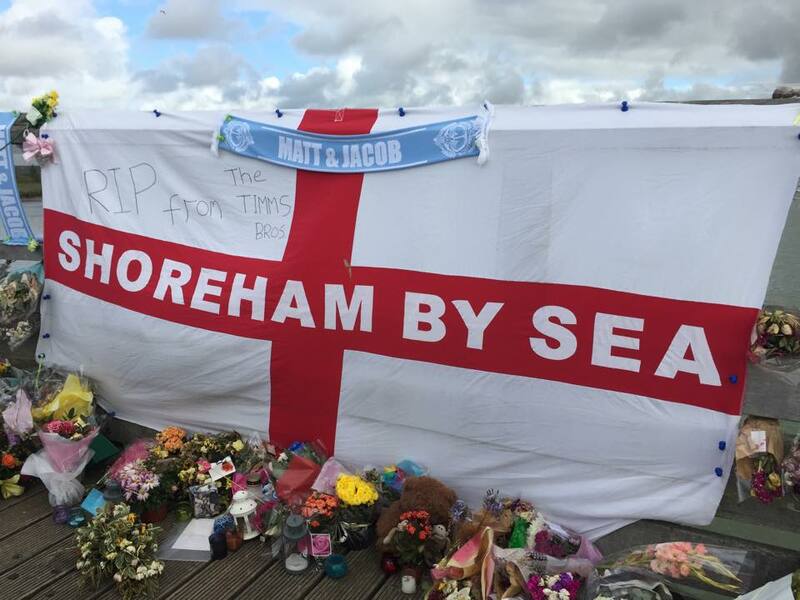 The tragic irony is that every single person involved would have preferred it if Shoreham had been just another airshow and Hull just another game. Hull City At Home – Unsatisfactory? I thought about a subtitle for this post but so much was going on I couldn’t decide which to use. What to focus on? That the work commitments that stopped me getting a ticket annoyingly disappeared when the railway line at Patcham flooded? That, in any case, by then I had invited one of our new generation of fans round from crisps and the game on TV in my continued, successful, efforts to brainwash them? No, these are personal. The big debate at the end of the game was around our use of a ‘weakened team’ and the end result, another unwanted Monday night game. So. Declaration of bad fan-ness first. I watched the game on TV. Yes, I know it’s not the same thing but as soon as the game was moved to a Monday there was enough doubt about me making it to Falmer in time because of work commitments that I didn’t bother getting a ticket. A shame as Reading had been one of my favourite games of the season so far and I had taken the boy and his friend for a very reasonable cost indeed. The same pricing was repeated for Hull but then the game moved to Monday and Monday night football really does stink like a dead tramp’s balls. Instead I invited the boy’s friend and his mum over to ours for the game on TV. About five minutes after they accepted the news came through that the Preston rail tunnel had flooded and the trains the next day would be diverted and cancelled. Inevitably I worked from home and inevitably the meeting I was worried about disappeared. Never mind. The crisps and beers were bought and arrangements made. At least I wouldn’t miss kick off. Another thing that happened the day before kick off was the 6th round draw and the result gave us, at least in the fans’ minds, a massive incentive to win. Not only would we be in the Quarter Finals but we would be at home. To Sunderland. Gus Poyet’s Sunderland. Unless he hits the roof in the meantime. Now no disrespect to Hull. They are a division above us having deservedly been promoted last season. But they are also not Manchester United (mind you, neither are Manchester United these days) or Chelsea. At home they represented a reasonable chance of us getting in to the next round. But when the teams were announced we had made several changes. Had we selected a weak side and blown our chances of progressing? Not for me. Apparently others didn’t agree, including Robbie Savage. I’ll tell you why I take that view. Brezovan came in for Kuszczak. The P.I.G. is a better keeper overall but Brezovan has been excellent whenever I’ve seen him deputise and his distribution is better. Calde and Bruno have been vying for the right back slot all season. Dunk is a former Championship regular who had an excellent game. The midfield three almost picked themselves with Orlandi having had a shocker there last time out, Agustien moody and out of form, Stephens cup tied and Bridcutt sold. KLL and Buckley playing just behind Ulloa is about as attacking as we get. Only Chicksen for Ward looked seriously weaker and yet he had excelled against Reading and is an excellent prospect, rapid and organised. He has to play some time. But the point is that it is a squad game. Rotation is vital in an overall season and no one – no one – plays the same side week in, week out these days. The game itself certainly didn’t look like a Premier League team against a weakened Championship side. 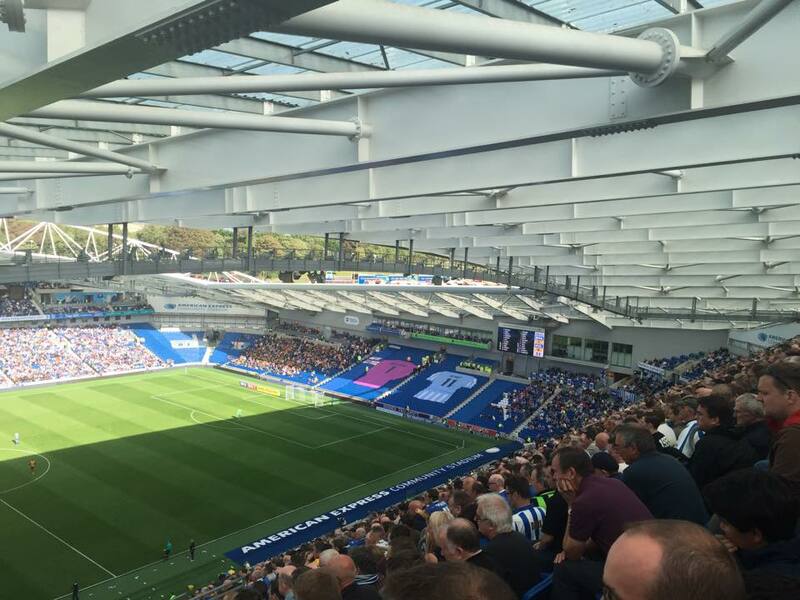 The Albion started the brightest though without carving out a really good chance. Then we got lucky. The woodwork has been our enemy all season but, as Sagbo wasted a great chance by hitting the bar, it became our friend. On half an hour we took the lead with one of the best goals we’ve scored all season. Magical interplay between Ulloa and Buckley sent the former scampering clear and Huddlestone knew he couldn’t foul if he wanted to stay on the pitch. A cool finish put us 1-0 up and the cheers from the front room probably woke up our sleepy new street. The two sides then missed a good chance each. Curtis Davies should have equalised for Hull before Ulloa missed a free header from about six yards out. Probably the worst result for both sides would have been a draw. So of course Hull pushed on for the equalizer and we sat back. We also tired. Buckley lasted only 45 minutes but was replaced by March who had started the last two league wins. KLL started to exaggerate his falls and got less change out of the referee as the game went on. The centre backs, who’d been excellent all game, came under more and more pressure. And eventually Hull scored. Both sides went for it in the last few minutes but neither could push on and that was it. A (result wise) totally unsatisfactory draw, but an excellent game in which we acquitted ourselves respectfully against the sort of side we will have to match or beat week in, week out if we ever go up. Was our team selection unsatisfactory? No. Is it unsatisfactory that a TV channel with very few subscribers can make us play an FA Cup 5th Round tie on a Monday night when the trains are wrecked? Yes. Is it unsatisfactory that UEFA rules dictate the replay is again on a Monday, just 48 hours after a big league game against Wigan? Yes. Is it unsatisfactory that the magic of the cup has deteriorated to the point where the semi can be at Wembley but the final is no longer the season finale at the traditional time? Absolutely. We will undoubtedly play two very different teams against Wigan and Hull. And yet we will give it our best shot possible. After all, Gus still awaits the winners.